Young men make up a disproportionately large share of people who play video games in the United States. But about four-in-ten women and roughly a quarter of Americans ages 65 and older also say they play video games at least sometimes, according to a Pew Research Center survey conducted in March and April. As with other types of technology, video games are most popular among young adults. Six-in-ten Americans ages 18 to 29 and 53% of those ages 30 to 49 say they play video games often or sometimes, compared with smaller shares in older age groups. The survey counts video games played on a computer, TV, game console or portable device, such as a mobile phone. There is a substantial gender gap in the share of young adults who report playing video games. About seven-in-ten men younger than 30 (72%) say they play video games often or sometimes, compared with 49% of women in the same age group. Among those ages 30 to 49, 58% of men and 48% of women play video games. When it comes to older adults, similar shares of men and women say they play (27% of men ages 50 and older, compared with 30% of women). Previous research by Pew Research Center shows similar trends. Video game use also varies by education, with college graduates (36%) significantly less likely to play than adults with some college experience (50%). About four-in-ten of those who did not attend college (42%) say they play video games. In spite of other recent research that suggests that playing video games is associated with a decline in work hours among younger men, the Center’s March-April survey finds that adults who work full- or part-time are about as likely as those who are unemployed and looking for work to say they play (47% vs. 43%). 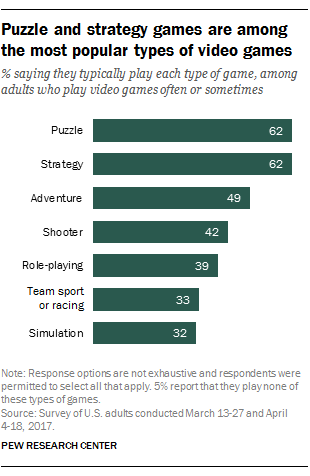 As for types of games that Americans like to play, strategy and puzzle games are the most popular among those included in the survey. About six-in-ten adults who say they play video games often or sometimes report that they typically play these types of games (62% each). Adventure, shooter, role-playing, team sport or racing and simulation games are all somewhat less commonly played, with about half of video game players or fewer saying they typically play these types of games. 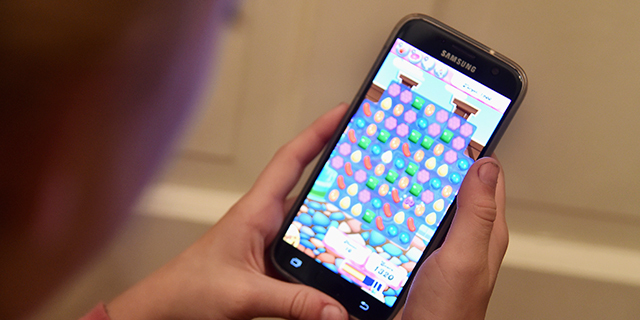 Unlike other types of games, puzzle games are more popular with women than with men: 72% of video-game-playing women say they play these, compared with 52% of video-game-playing men. Puzzle games are distinct in other ways. For example, they are the only type of video game asked about in the survey that is more popular with those ages 65 and older than with those younger than 30, and they are more likely to be played by those with at least a bachelor’s degree than by those with less education. While strategy games are favored by those with at least some college education, most other types of games are more popular among adults with lower levels of education. For example, 46% of video game players with some college education and 44% of those with a high school diploma or less say they typically play shooter games, compared with 32% of college graduates. There is no significant difference by education level for simulation games.